Yesterday, Warner Bros. unveiled the first two official photos of Alicia Vikander as Lara Croft in the studio's highly-anticipated Tomb Raider reboot, which is currently filming in South Africa. Today, Warner Bros. has revealed yet another official photo, which shows Lara Croft brandishing a climbing ax, emerging from a thick cloud of dust. Unfortunately, we don't have any other details about what's happening in this scene. But the studio did reveal the official synopsis. Going explicitly against his final wishes, she leaves everything she knows behind in search of her dad's last-known destination: a fabled tomb on a mythical island that might be somewhere off the coast of Japan. But her mission will not be an easy one; just reaching the island will be extremely treacherous. Suddenly, the stakes couldn't be higher for Lara, who, against the odds and armed with only her sharp mind, blind faith and inherently stubborn spirit, must learn to push herself beyond her limits as she journeys into the unknown. If she survives this perilous adventure, it could be the making of her, earning her the name tomb raider. Production began on Tomb Raider back in January. From Warner Bros. Pictures and Metro-Goldwyn-Mayer Pictures, Tomb Raider is the story that will set a young and resolute Lara Croft on a path toward becoming a global hero. The film stars Oscar winner Alicia Vikander (Ex Machina, The Danish Girl) in the lead role, under the direction of Roar Uthaug (The Wave), with Oscar-winner Graham King (The Departed) producing under his GK Films banner. The film's production begins on the heels of the 20th anniversary of the wildly popular videogame franchise from Square Enix, Crystal Dynamics and Eidos Montreal. Dominic West (Money Monster, 300), Walton Goggins (The Hateful Eight, Django Unchained) and Daniel Wu (AMC's Into the Badlands). Shooting on location in South Africa and the UK, Roar Uthaug directs from a script by Geneva Robertson-Dworet. The director's behind-the-scenes creative team includes director of photography George Richmond (Mission: Impossible - Rogue Nation); production designer Gary Freeman (Maleficent); Oscar-nominated editor Stuart Baird (Skyfall, Gorillas in the Mist); and costume designer Tim Wonsik (key costumer, Guardians of the Galaxy, Captain America: The Winter Soldier). Tomb Raider will be distributed by Warner Bros. Pictures, a Warner Bros. Entertainment Company, and in select territories by MGM. 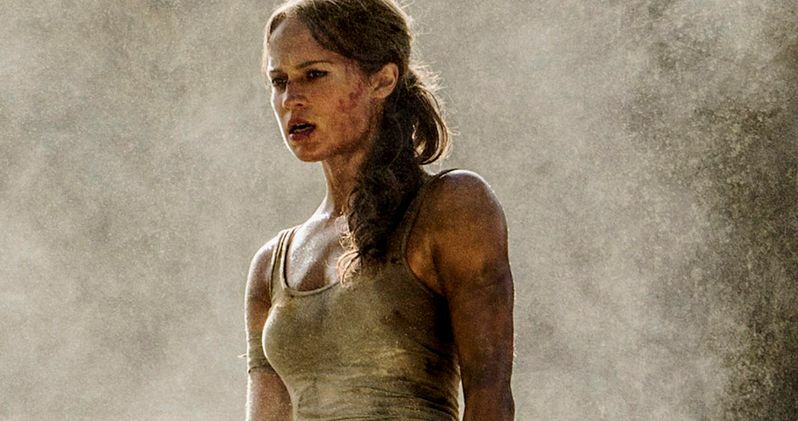 Take a look at this new photo from Tomb Raider below, featuring Alicia Vikadner as Lara Croft.